Scott's from Kentucky and O'Brien from West Virginia, but even without knowing that, anyone listening can tell they come by their mountain music credentials honestly. Add to that their willingness and qualifications to address mountaintop removal and the legacy of mining in that part of the world: note their dead-on take on John Prine's "Paradise" (including a version with Prine himself), which plays off their original song "Keep Your Dirty Lights On" - odes to a back-breaking legacy and mountains removed, never to return, so a growing nation could have power and "Mr. Peabody" could keep his coal train filled. There are common country and mountain music themes - religion ("On Life's Other Side"), family ("Memories and Moments"), love both found ("Angel's Blue Eyes") and lost (an absolutely devastating, mournful take on Hank Williams' "Alone and Forsaken"). 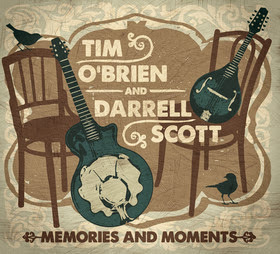 And the album features unadorned traditional country and mountain music instrumentation - just perfect interplay among resonators, acoustic guitars, fiddles and mandolins. The album is on a newly formed label, Full Skies (a combination of Scott's Full Light and O'Brien's Howdy Skies) and distributed via Thirty Tigers. It's wonderful in every way - great singing, great playing, and you can feel their love for the music. You can buy it at their combined website (link below) - either digital or physical CD. NEW SONG: Belgian Fog - "You Drive Me to Madness"